Syska trimmers have generated much hype with their TV campaign. 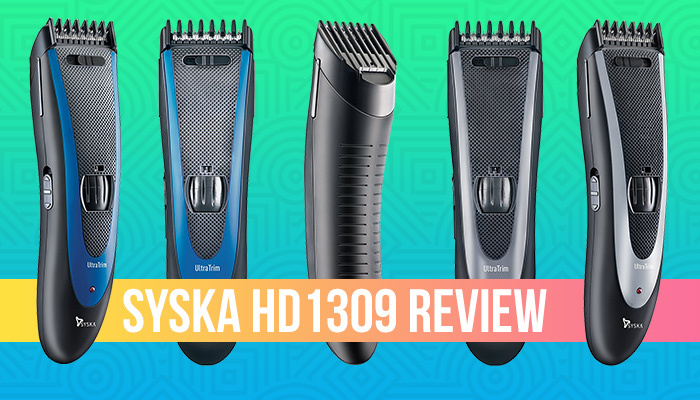 In this post we will take a look at Syska HT1309’s review, features and specifications to determine whether this trimmer lives up to its name. 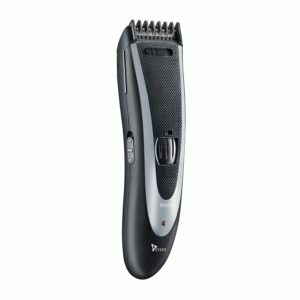 We will also compare this Syska Trimmer with a few popular Philips Trimmers so that you can make an informed choice of buying a trimmer. The Syska HT1309 has a plastic body with a slightly curved grip. While all trimmers have slight curves so they can be gripped properly, the Syska HT1309 has a much bigger curve than usual. The plastic feels solid and the trimmer has meshed grip on the back and a textured feel on the front. The sides, however, are smooth. We would have preferred the sides also be textured to have a good grip while using the HT1309. Now let’s move on to the features of the Syska HT1309. The HT1309 is a wireless trimmer. Syska chose to put steel blades in the HT1309. While titanium blades are much better, Syska claims that the blades on the HT1309 are self-sharpening. While trimming, the blades come in contact with each other and sharpen themselves. Only timely use can confirm if that information is true or not. The Syska HT1309’s blades are also oil-free, that means you do need to put in any oils to maintain the blades. However, keeping the blades dry is highly recommended. On the trimming front, the HT1309 has both clipper and trimmer features. 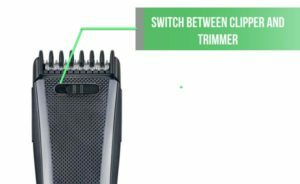 The trimmer has a built adjustable comb which can be used to adjust the thickness of the beard of the trimmer. The trim range on the Syska HT1309 ranges from 0.5m to 24mm. Some people prefer thickness less than 0.5mm, so please note if you are one of them. The high range of 24mm however, makes it easy to maintain thick beards. The minimum adjustment on the Syska HT1309 is 1mm, so you get a total of 25 length adjustments to choose from. Some customers have claimed that the actual trimming range of the HT1309 is actually only up to 15mm, while the technical documentation says 24mm. We have reached out to Syska to confirm. Syska HT1309 has a battery capacity that lasts 60 mins while requiring a charge time of 8 hours. A helpful charging LED indicator helps you know the charging status of the HT1309. Coming to the battery technology, the Syska HT1309 is powered by a Ni-Mh battery. Ni-MH stands for Nickel Metal Hydride, which forms a type of rechargeable battery. According to this Wikipedia article, Ni-Mh batteries can have three times the capacity of a Ni-Cd (Nickel Cadmium) battery but its power storage density is almost equal to a Lithium Ion (Li-on) battery. We would say the choice of the battery is good in Syska HT1309. However, if there are certain precautions to be taken with the NiMH batteries. They lose their capacity if they are overcharged frequently. To avoid this, we recommended that you do not charge the Syska HT1309 for longer than recommended. Li Mh batteries also suffer from temporary loss of capacity if they are not fully charged-discharged. To avoid this issue, we would recommend that you occasionally use the Syska HT1309 till the battery dies completely and then fully charge it. If you are interested to know more about Ni-Mh batteries, you can download this PDF file from Energizer. Moving on the performance review of the HT1309, which is the most important aspect of any trimmer. Based on our tests, the Syska HT1309 works well for its price range. You may get slightly better performance on a Philips trimmer, but you will pay 2 times the price for that. 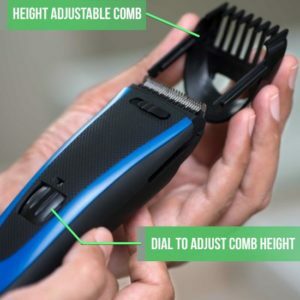 For the actual trimming, you start by putting on the trimming comb and then adjusting the front dial to the height you want. The higher the number on the adjustment, the bigger beard you will maintain while trimming. A good point about the trimmer head on the Syska HT1309 is that it has a wide cutting head of 32mm width. This helps in trimming a lot of hair fairly quickly. Using the clipper feature, you can even style your hair. We are not sure how convenient it is or what results it will bring. We recommended that you stick to your barber for hair styling. To style your beard and finely tune it, you can remove the hair comb and expose the blade. You can then use the blade directly to define the edges of your beard. Some customers have complained about not being able to trim their hair properly with this trimmer. We would say that it’s not the trimmer’s fault. A trimmer has to be used in a certain way to make sure that it performs the best. Here are some pointers. For cleaning and maintenance, you can use the detachable feature of the head of the Syska Trimmer and wash it under water. The head is waterproof so you need to worry about damaging it. It is recommended that you dry the blade thoroughly before storing it to avoid any issues. You can also use the provided cleaning brush to remove stuck hair and dust inside your blades. The Syska HT1309 is available in 2 colors, black-blue and black-grey. Both colors are identical in their use. Inside the box, you get the trimmer itself, a power adaptor, user manual, a cleaning brush, and a warranty card. The Syska HT1309 comes with a 2-year manufacturing defect warranty which you can claim in case anything goes wrong. Apart from our review, we also navigate through hundreds of reviews to uncover common issues. Good news is, there are no persistent issues in the Syska HT1309 that you should be worried about. The only complaint that some users have is that the trimmer heats while using it. This is quite normal and you shouldn’t worry about it. But, if the trimmer heats so much that it’s uncomfortable to hold, then you should definitely contact a service center. The Syska HT1309 is a wonderful entry level trimmer. We like it’s beard trimming ability, but we don’t recommend you style your head hair with it. The HT1309 has great features and is a reliable trimmer for a variety of uses. It’s pretty cheap compared to other big brand trimmers but still retains all the great features. We highly recommended it. 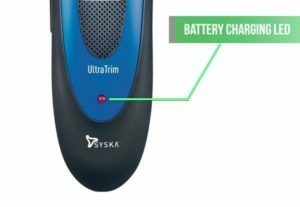 Buyed syska trimmer-” worse product, worst service” . #don’t even ask for syska. Sorry to hear that Farrukh. Did you buy a replacement?